guess who's got a column in BUST? 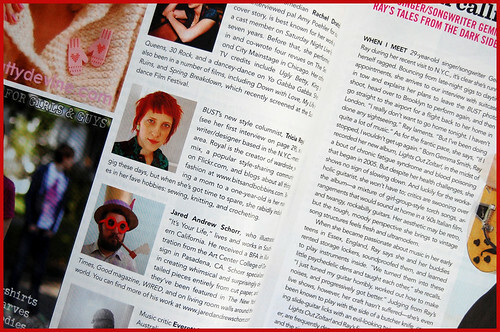 i've got an article in BUST magazine this month...well, it's sort of a column...it's the LOOKS column! i am so very honored to have been asked to do it; the LOOKS column has been one of my favorite features in BUST since i started reading the mag in the early 2000s...i have torn out and saved tons of the previous featured girls & their interviews over the years! 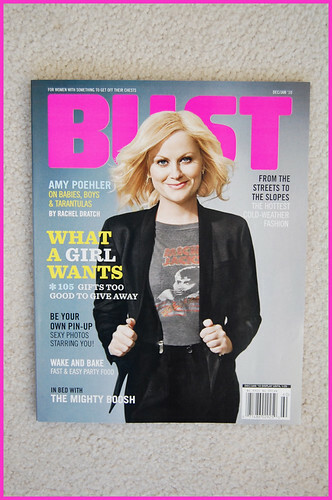 BUST is, hands down, one of my favorite magazines, i am always delighted when it lands in my mailbox. how incredible is it to get the chance to WRITE the LOOKS column?? pretty awesome. a dream come true actually. the first interview for the column is with the absolutely gorgeous and unique tamera ferro, of verhext.com, who has been a long time contributor to wardrobe_remix (since close to the beginning, i think??). i've always admired her style...there's absolutely no one like her in the universe (especially style-wise!) and i felt she deserves the recognition and accolades! doesn't she look stunning??!! such a creative gal.